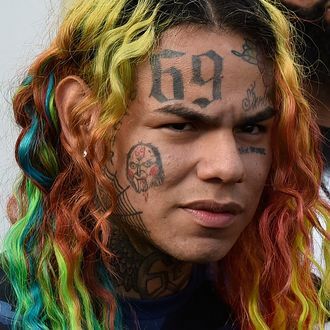 Brooklyn rapper Tekashi 6ix9ine was sentenced to four years’ probation on Friday for sexual misconduct involving a 13-year-old girl. The rapper, whose legal name is Daniel Hernandez, admitted in 2015 to “using a 13-year-old in a sexual performance,” that was then posted online. Because the 22-year-old rapper copped to the charge under a “youthful offender” plea agreement, he could have avoided jail time altogether by staying out of trouble, as well as earning his GED and serving 300 community service hours. Prosecutors claimed Hernandez hasn’t held up his end of the bargain — by getting arrested two times in 2018 — and have been pushing for him to get a jail sentence. Cops arrested Hernandez in May after he allegedly attacked a 16-year-old fan at a Texas shopping mall while he was trying to record video of the rapper. Hernandez was then arrested again in May after a traffic stop and accused of assaulting an officer at the station following that arrest. Weiss also said that Tekashi might have shed his scumbag label but is now flaunting “his membership in a violent gang.” “We know he is a gang member because he talks about it. He publicly identifies as a member of 9 Trey,” a Bloods offshoot, she explained. Mennin was apparently swayed by the description of good works, saying he “has engaged in a number of acts of unsolicited generosity and service to members of his community.” Mennin said that he’ll receive credit for one year of his probation. He will remain out as long as he stays out of trouble and does 1,000 community service hours. She also downplayed the Texas incident as him possibly “pushing back against an amateur paparazzi.” When she issued her decision, the courtroom erupted into applause. Updated: According to TMZ, gunfire broke out at a post-sentencing dinner in mid-town Manhattan following an argument between Hernandez’s entourage and a record executive’s bodyguard. “A third party” allegedly fired four shots during the dispute, hitting one of Hernandez’s bodyguards in the stomach. He was subsequently taken to the hospital.